Tuesday, April 1, 2014 I went, on a whim (and in my car), to the south end of 7th Street. 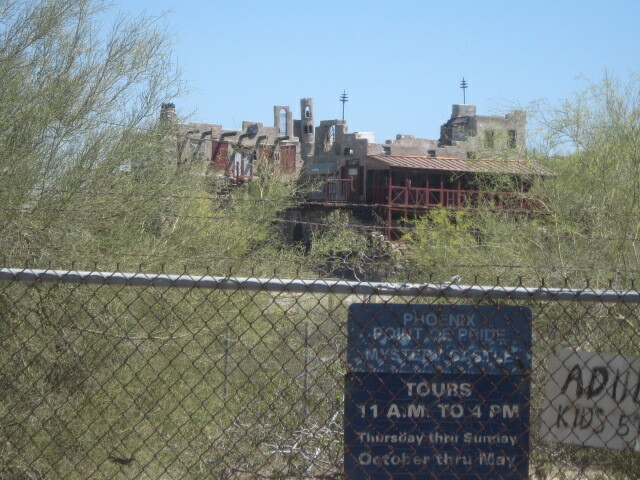 Some day I need to do an end to end trip on 7th Street and show all the significant things that are located on that one vital thoroughfare in Phoenix, but not today. Today I found something else, and since I had my camera with me, I took pictures, and mainly for those of you who might actually enjoy vicariously strolling through the Arizona desert with me, I have this record of the day’s adventure. With the right attitude, every day is an adventure–do you agree? 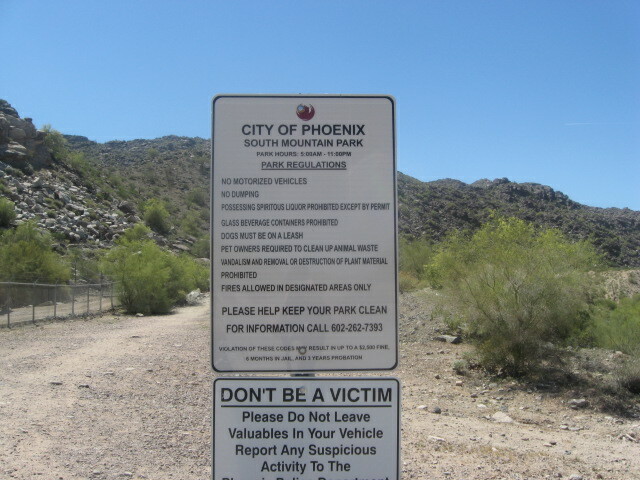 South Mountain Park is, I believe, the largest city park in the world. It contains an entire mountain range and is about 20 miles long and ten miles wide. 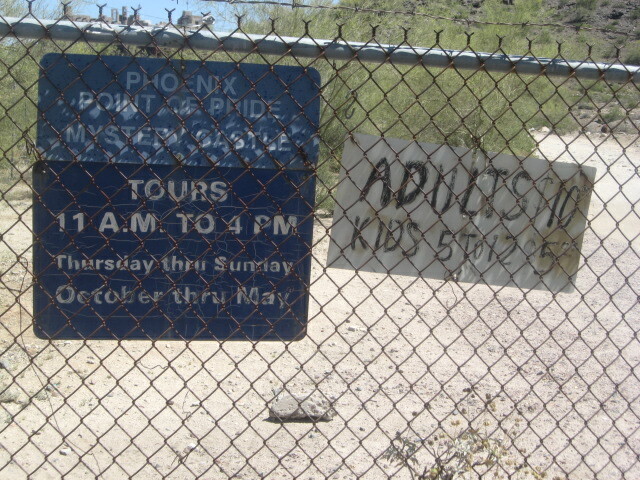 There are numerous ways into the park, only one goes by the park ranger station. In a lifetime in Phoenix, this is the first time I have ever seen this entrance. There is a nice trail, and I want to walk a mile or more every day, so I decided to enter. The time is near 11 a.m. There is an unnatural depression/valley/crater near the entrance. 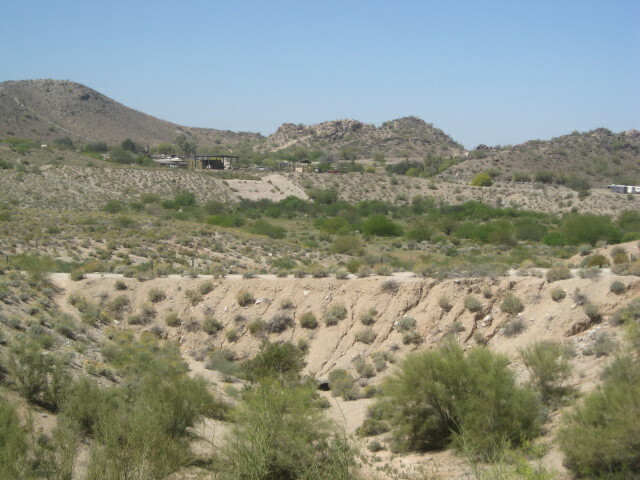 It might just be the end of a gully that has widened out a lot, but perhaps it is the remains of an open pit mine that is so old that the desert has reclaimed it. You can’t tell from the photo, but the bottom of this depression is a good 50 feet below where I am standing, and is quite flat. Do you see the far walls on the other side of the pit. 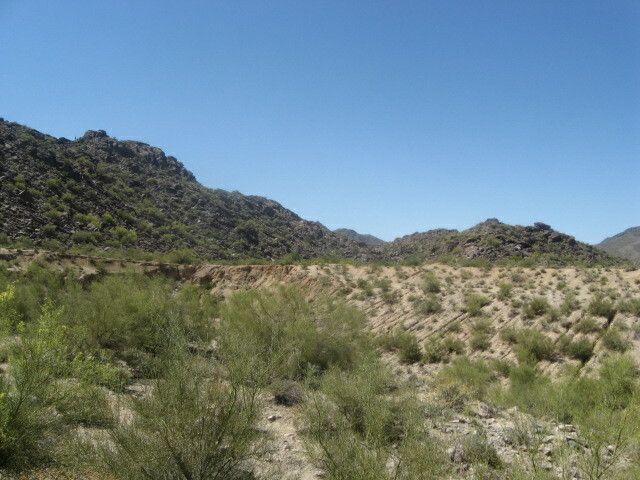 These are typical of gravel pits and other big open mines in Arizona. The houses over there are very nice, upper middle class dwellings, and all this flatness is not typical of the bottom of a mountain range. 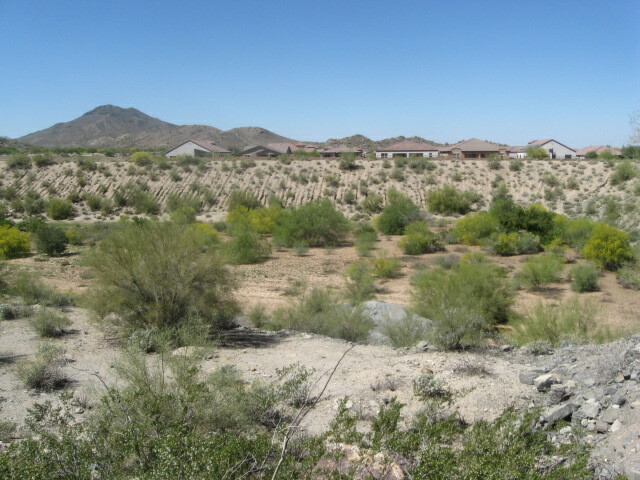 Everything should be sloping downward toward Phoenix in the north. It’s a mystery, and I don’t suppose I’ll ever know how this place came to exist, but I’m pretty sure it isn’t natural. 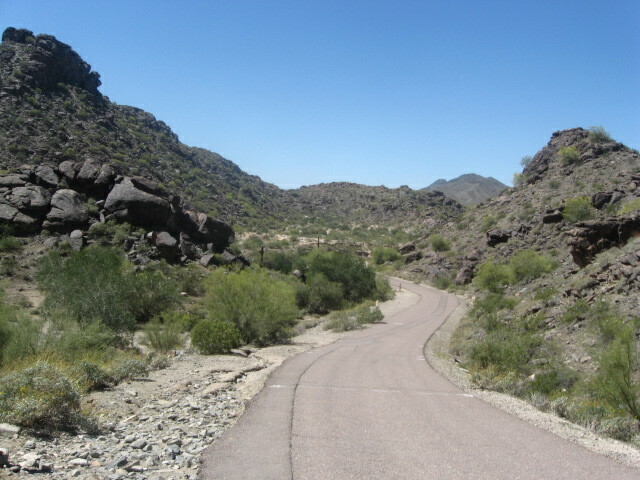 Once I got past the dirt trail I started on I found a paved road. That seemed kind of strange because there is no way for a vehicle to reach that road. 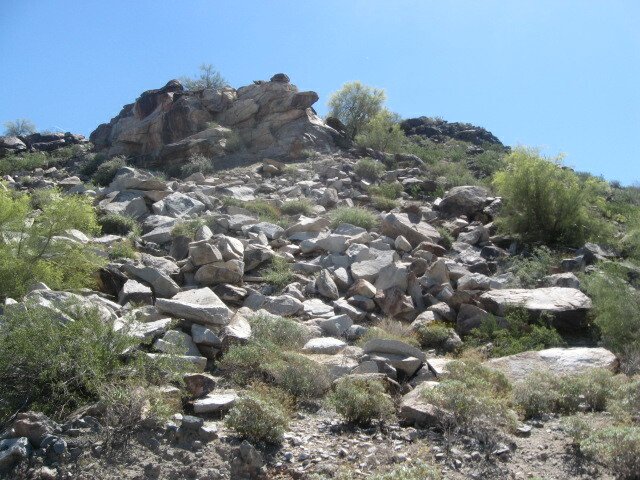 The entrance I used is a foot trail barely wide enough for a car at the beginning and too narrow for one a little further on, and it is blocked off by thousand pound boulders placed across the entrance. Perhaps there is a way in through the fenced-off water tanks at the ends of the trail, but I don’t know how the city made this nicely-maintained stretch of asphalt. Broken rock landslide area. 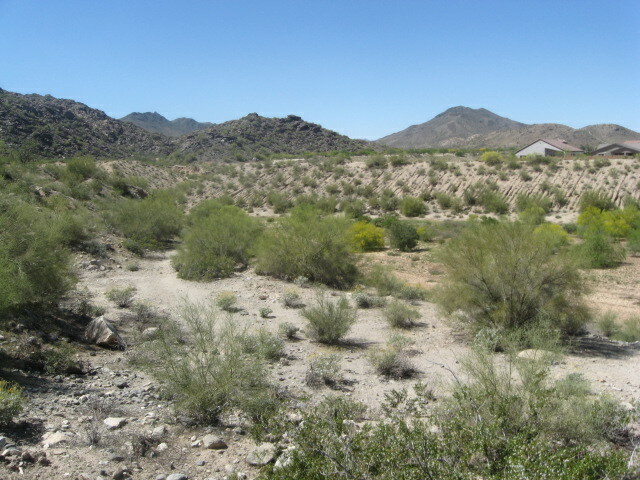 Desert scenery. I just like to look at and discover such places. Looking back the way I came in. 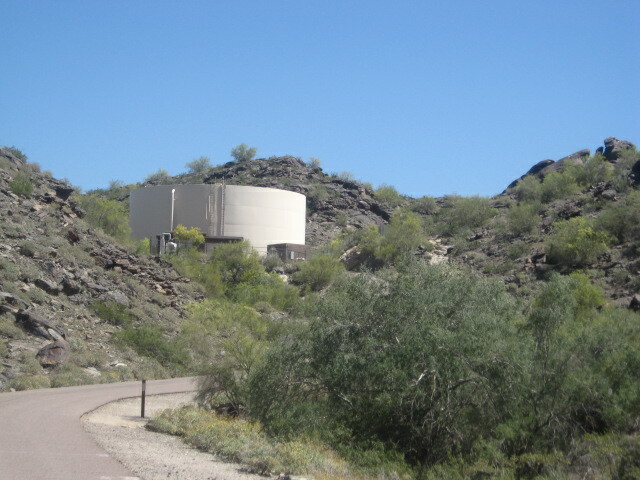 The huge tank is probably storing water for South Phoenix. It’s not like any explanation is posted for it. 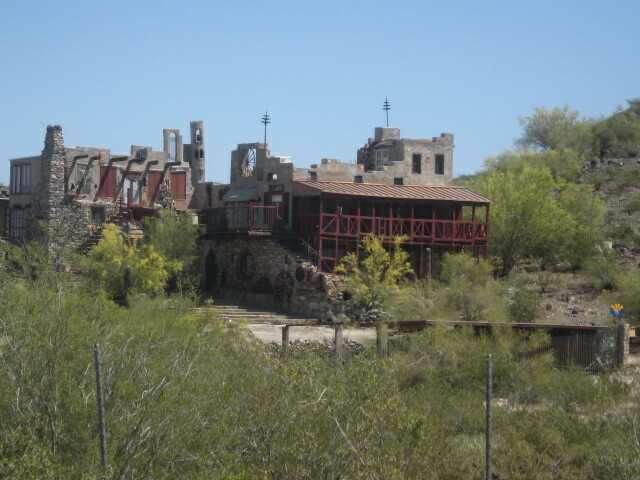 Another view of the depression. Some time I may return and climb down into it. 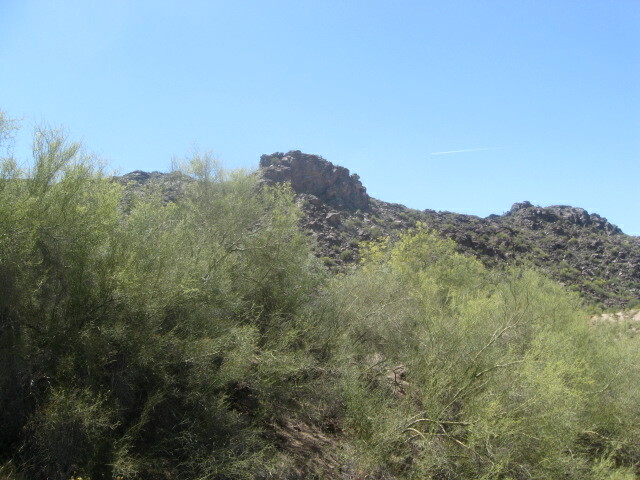 Mountain slopes and mesquite trees. A view across the pit. 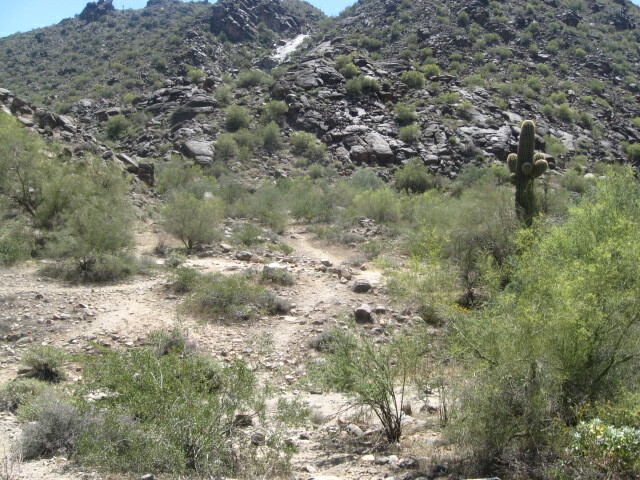 The eroded slope in the foreground is more typical of an Arizona gully. This is the southern end of the pit. 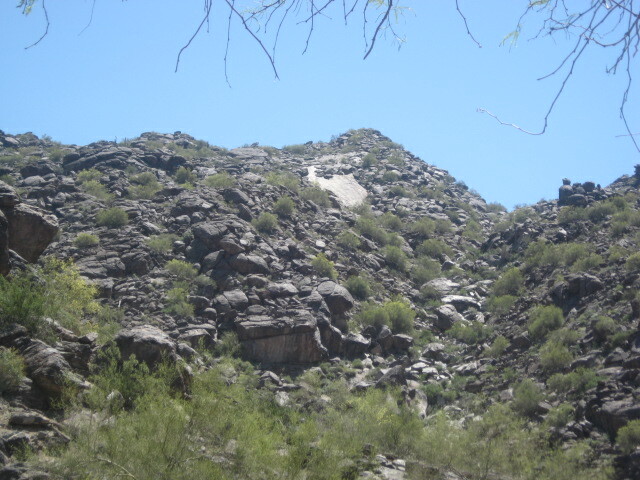 The mountain slopes become very steep here, and a true gully appears. My walk has taken me to the end of the big pit where a real desert wash empties into it. 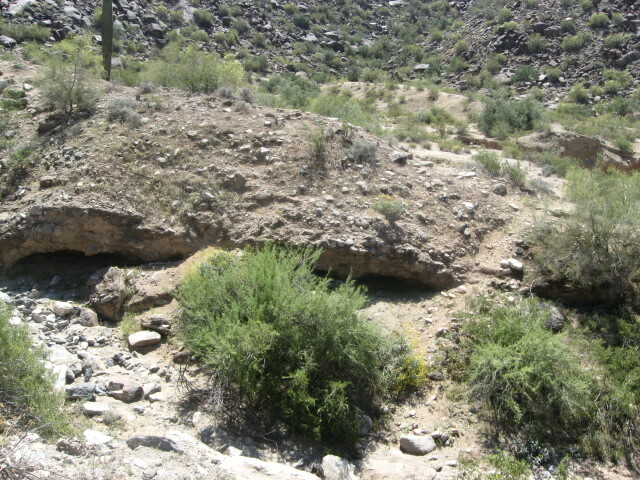 The tumbled rocks and the undercut caves on the far side are typical of such watercourses. 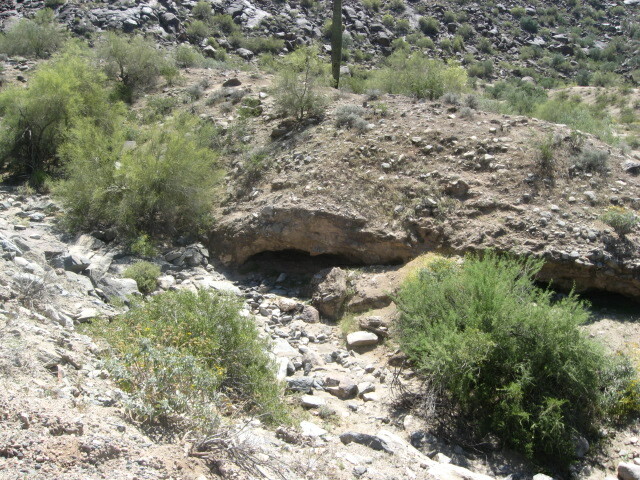 The caves provide shelter for all manner of desert wildlife. This area is well explored (by others). 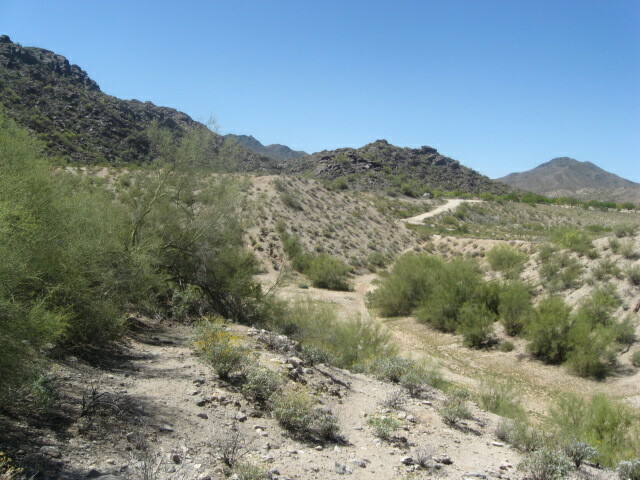 Here is a trail leading across the wash. 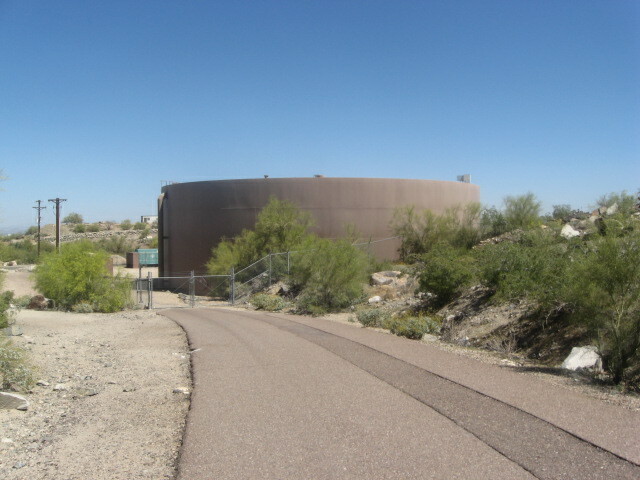 The road climbs to this other big tank nestled between two hills and fenced off from the world. 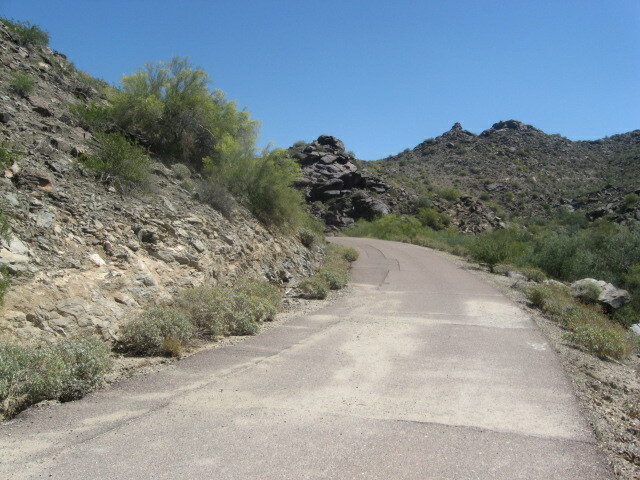 Looking uphill. 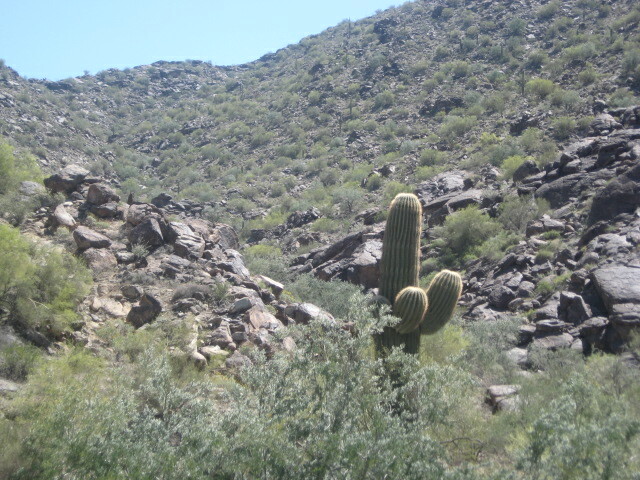 This desert is not real good country for saguaro cactus, but there are a few, and here is one that has found a home. A trail on the ground. 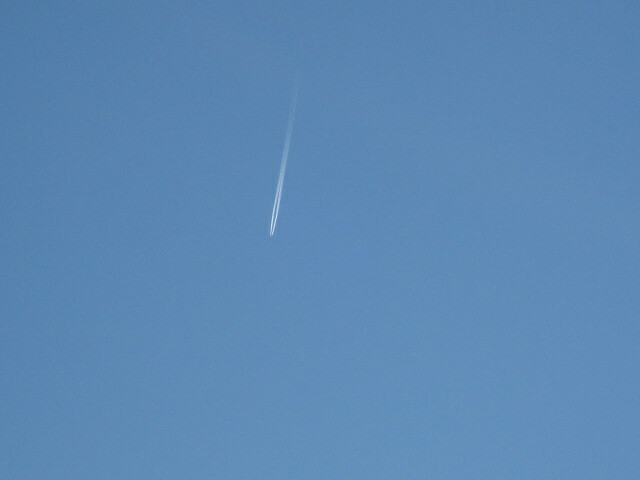 A trail in the sky. 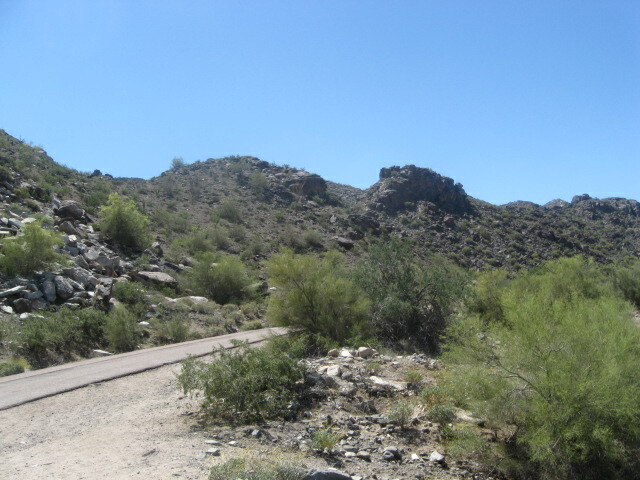 That desert trail I’ve been talking about apparently has a name. I will wind up on this trail that leads to the summit some 2.5 miles away, but I’m not prepared to climb any mountains today. As I was looking at the signpost, this woman came down the trail. I said good morning, and asked her where the trail led. This developed into a short conversation. I told her my name (Ken), found out her name is Barb. 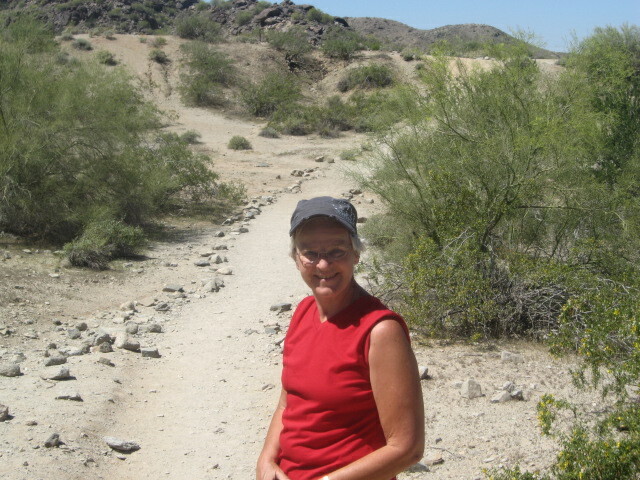 She hikes in the desert two or three times a week and goes many different places including the Superstition Mountains and Prescott. I offered to walk her back to her car, just to continue the conversation. 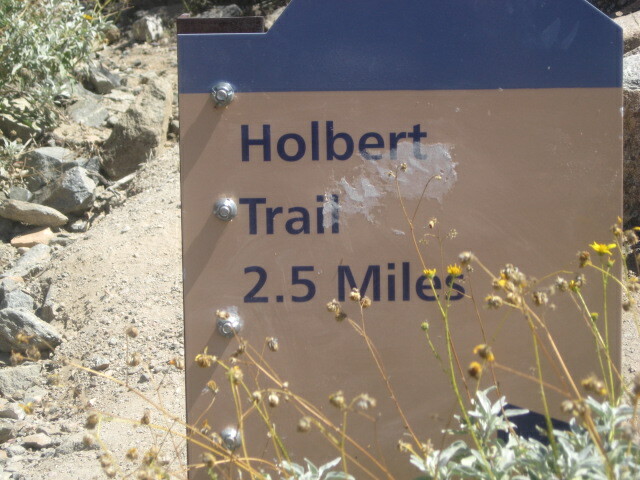 We stayed on the lowest reaches of the Holbert trail for another quarter mile, just chatting about the desert, and hiking and such. I probably should have asked her to get a picture of me, but, oh well, didn’t think of it. 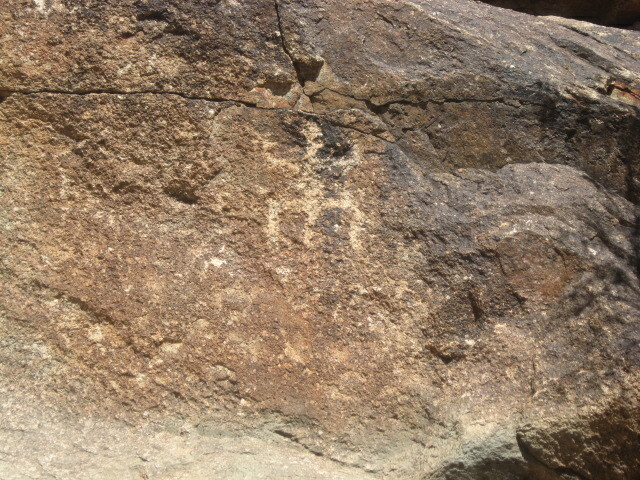 I have seen petroglyphs at South Mountain before, but wasn’t really expecting any. This is clearly a lizard. This is more likely to be a man, or perhaps a horse or coyote. If that is a tail, then it’s an animal. Barb had taken a guided walk with a ranger on this trail before. 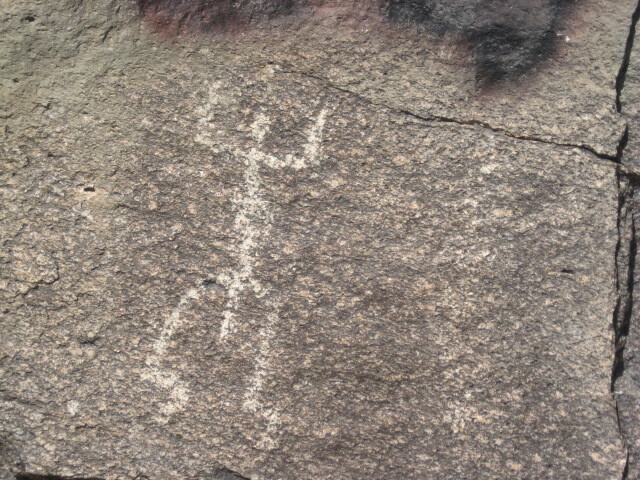 She told me that the ranger said these petroglyphs are relatively modern, and not made by the Amerindians who lived in this part of the country. 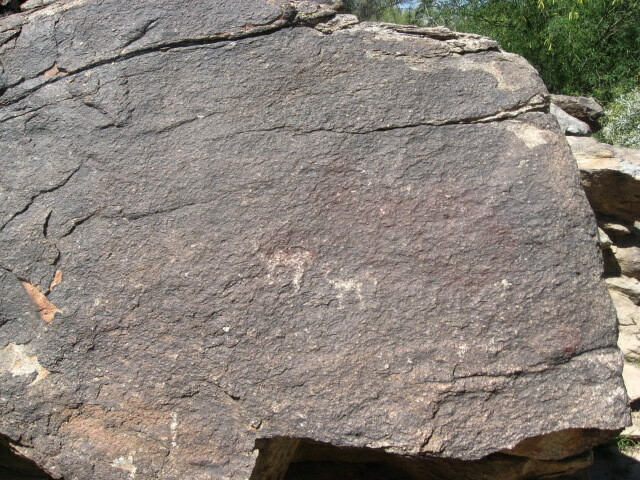 But these petroglyphs are authentic. You can see a solar symbol, a desert tortoise, and a snake. The rangers have erected a small fence to keep people away from these glyphs. 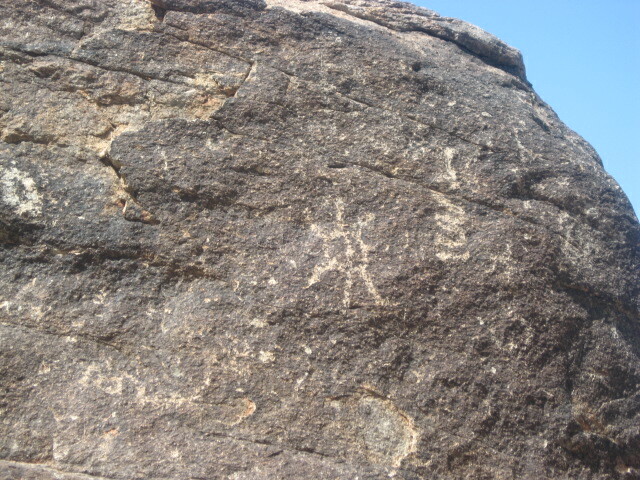 Near the end of the trail I noticed these glyphs. I think they look like camels because of the humpy back and curving necks. The U.S. Army did import some camels into the Arizona desert after the Civil War, although the experiment was not a great success. Or they might be horses, though I like my camel hypothesis better. A wonderful thing about such scratches on the rock–they make one think, wonder, and dream, but there is really no way for me to ever know the truth. Back at the parking lot, I take one last look back up the hill. I wonder what caused that big scar up on the mountainside. I think I’m about done here, but my adventure isn’t quite over yet. Barb gave me a lift in her van back to my car some 7 blocks to the east. Looking around I see some signs I hadn’t noticed before. I have found the location of Mystery Castle. There is quite a story about this place. I visited it once as a teenager 50 years ago. I tell Barb what I remember about it, though I haven’t given the place a thought in decades. It looks kind of sealed off and forgotten, doesn’t it? Raising my sight, I see the castle itself. Someone is living here. This sign is so worn out. 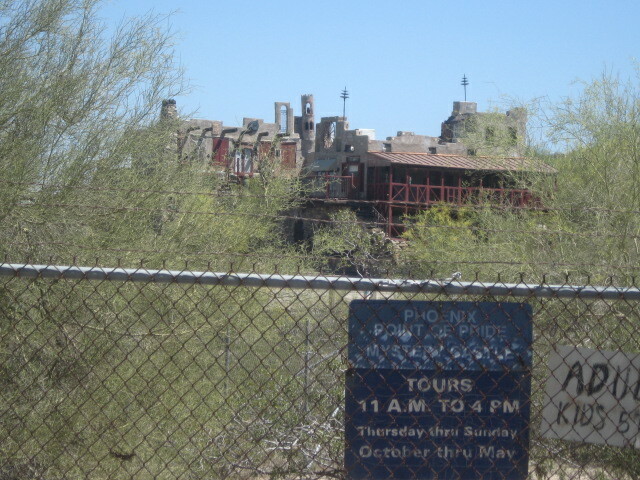 I wonder if they still give tours of the place. By walking off the road I find a better angle to photograph the house. This is how I know someone is living here. They have a guard dog. 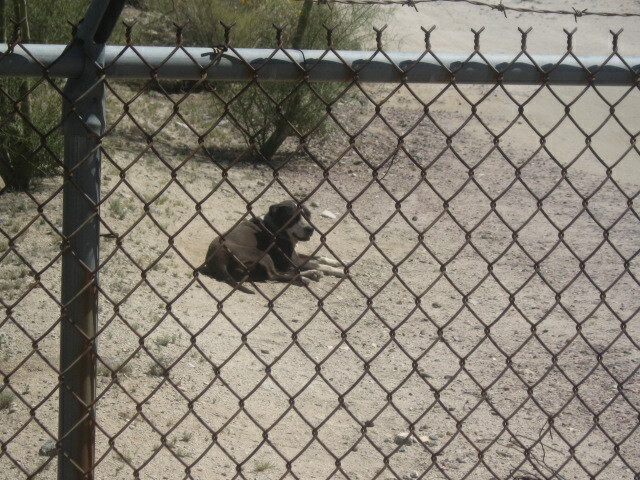 He barked at me once, even though I didn’t approach the fence or make any effort to get inside. Just being friendly, I guess. He didn’t get up and come over to the fence to see me. And that is my last photo from Tuesday morning. Although I did not find a striped stone, it turned out to be a morning well spent. I got a good walk of a couple of miles, made a friend, rediscovered a fabulous place that I had visited once 50 years ago. 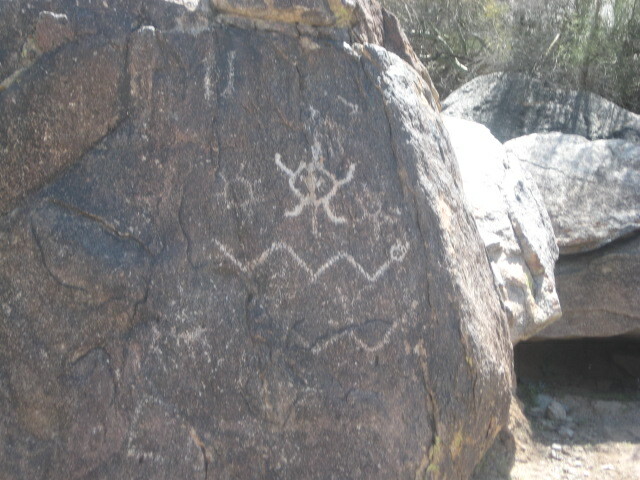 If you’ve ever hiked around the desert, admired petroglyphs, or visited strange architecture, why not leave a comment?